We at Farmacy Beauty are putting a spotlight on our favorite beekeepers, apiaries, bee-themed artwork and more in our #HoneySavior Series leading up to National Honey Bee Day – Saturday, August 20, 2016. Checkout www.farmacybeauty.com/bee-honey-savior to learn more about our initiative to inspire you, the consumer, to ‘bee’ a #HoneySavior by supporting your local bee populations by purchasing locally produced honey and planting nectar flowers! We spoke to Jack Algiere, the farm director over at Stone Barns Center for Food and Agriculture for our #HoneySavior series. 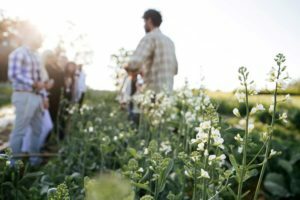 The farm works together with the world-renowned and award-winning restaurant, Blue Hill at Stone Barns, to demonstrate the importance of the locally sourced ingredients and the farm-to-table experience. Tell me about Stone Barns Center for Food & Agriculture – how did the farm get started? 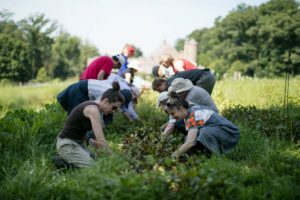 Stone Barns Center for Food and Agriculture opened in 2004 and is a nonprofit organization on a mission to create a healthy and sustainable food system. We are working to create a culture of eating based on what farms need to grow to sustain healthy soil and a resilient ecosystem. In our quest to transform the way America eats and farms, we train farmers, educate food citizens, convene change makers, and develop agro-ecological farming practices. You have an active apiary on the farm. 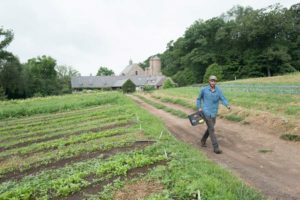 When and why did Stone Barns get into the beekeeping business? Our beekeeping began early in the development of the farm in 2004, sparked by interest from one of our livestock assistants. Having bees on the farm is of clear benefit to our vegetable and fruit production, and it provides a delicious product as well. The bees are vital to both native and cultivated production and are an integral component of this, and any other, resilient and sustainable farming system. 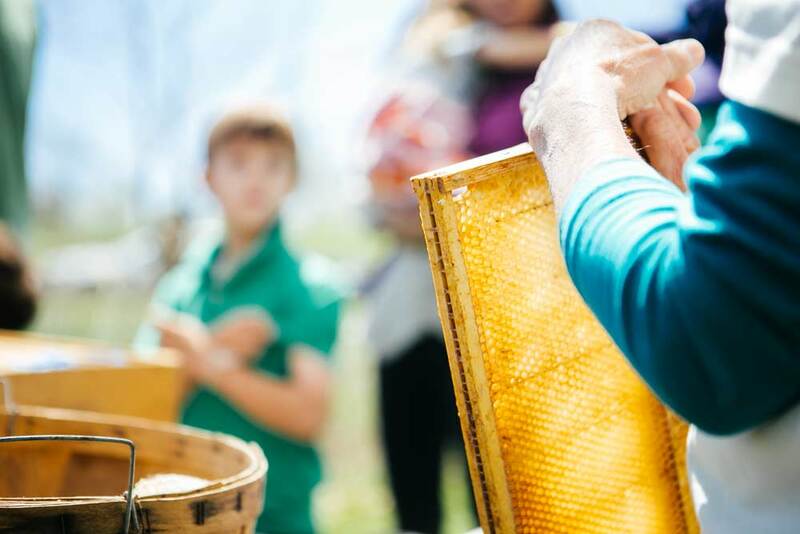 What about the environment makes Stone Barns an exceptional location for honey cultivation? We have worked to develop a rich and diverse ecosystem composed of several mixed habitats, both wild and cultivated. We also do not use synthetic pesticides or herbicides, making our seasonally diverse environment nectar-rich throughout the bees’ active seasons. What programs are held at the center to help educate consumers on the importance of bees and pollination? We work with other local beekeepers to offer weekly training workshops throughout the growing season to both backyard and farm beekeepers in the community. The two apiaries (22 hives in total) on the property are also regular stops on our numerous public and private tours held throughout the year. Our beekeeper, Maggie Schwed, is an excellent interpreter of the bees’ natural history and her work with them. Maggie has been with Stone Barns since 2009 and has worked throughout the farm—in the vegetable field and with other livestock—before focusing all her time on our bees. She is aided in her work by both volunteers and interns. Bees help increase genetic diversity in our ecosystem through cross-pollination between various plants. Why is this diversity important for your apiary, restaurant, and your woodlands? Diversity of plant species gives bees a buffet of food sources to choose from—and this variety is important to creating a consistent supply of food for them. Bees are critical in pollinating most fruit crops, such as squash, melons and many other fruiting vegetables. The honey produced by the bees is distinctive for each seasonal harvest, and we have found that it is improved by better and more consistent nectar sources including fruit and woodland trees, wildflowers, cultivated flowers, vegetables and herbs. What kinds of actions do you believe can be made to prevent the declination of our local honey bee populations? Diversified farms that commit to agro-ecological practices—avoiding pesticides and herbicides, reducing inputs such as synthetic fertilizers and petroleum products, embracing the principles of diversity, soil health and water quality—greatly improve the potential for honeybee populations and the multitudes of other wild bee species, butterflies and beneficial insects to thrive. Any special honey-infused recipes or tips that you would like to share with our readers? Since honey can be stored indefinitely, it is excellent for preserving a broad range of herbs, mushrooms and vegetables. Honey mixed with turmeric is regularly used for dressing wounds, scrapes, and cuts on our farm animals. Thank you so much Stone Barns for bee-ing a #HoneySavior – we’re so inspired by your passion and commitment to preserving our ecosystem and all the honey bees within it! Faramacy Beauty is fighting to save bees by donating $1 for every bottle of Honey Potion sold to City Growers, a nonprofit that engages city kids in active learning about where food comes from — including the importance of bees, pollination and the production of honey.